An eco-reserve in the heart of Puerto Vallarta’s jam-packed hotel zone? 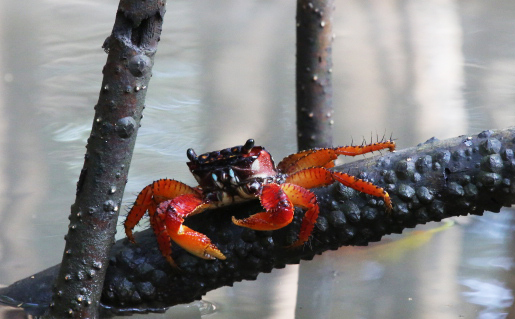 Unbelievable, but that’s exactly what I found at Estero El Salado, one of the city’s newest and most unexpected attractions. In spite of the traffic, it took only about five minutes to drive from our beachside hotel to the incongruously green haven separated by chain-link fence from the restaurants, shopping emporiums and high-rise resorts that crowd bustling Boulevard Francisco Medina Ascencio. On this October, morning my friend Lana and I stepped from our air-conditioned cocoon into a sauna-on-steroids, the humidity so intense that sweat was dripping down my cheeks before I had time to check my lens for condensation (big time). Our guide, Auralia, greeted us from the shade of an info kiosk and as I waited for the glass to clear, she began filling in background. 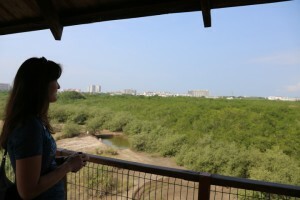 In a unique union of tourism and environmental protection, El Salado is actually part of the Puerto Vallarta International Convention Centre complex and a portion of the proceeds from every event goes to support the reserve and related research projects. 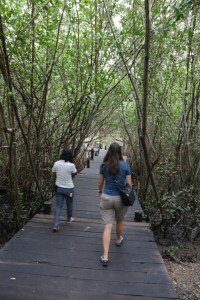 While scientific work has been going on for over a decade, El Salado was only opened to the public for guided tours in April 2012. 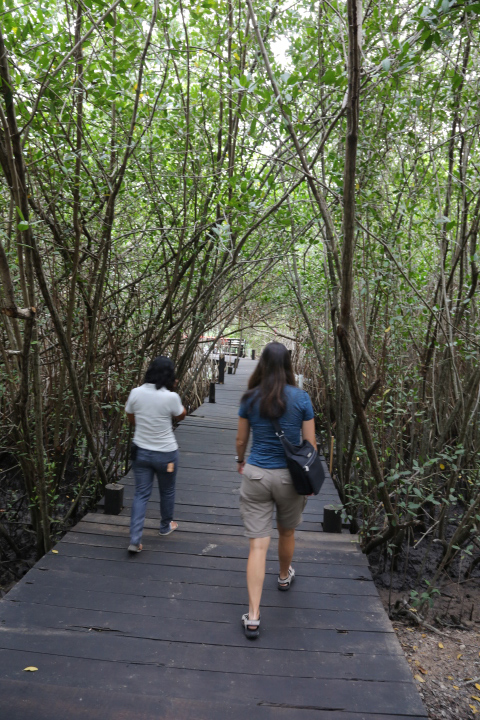 As we clomped over a boardwalk beneath an honour-guard arch of criss-crossed branches to get past mud flats barely visible among the tangle of roots, Auralia explained that the refuge protects 168 hectares of mangrove and marsh plants plus two remnants of sub-tropical and thorn forest. We emerged into the glaring sunlight on a broad dock at the edge of a two-kilometre long channel that threads through the dense vegetation. We each pulled on one of the nearly-new life jackets hanging on the rail and took a hand from driver and refuge security man, Francisco, to climb into an equally new-looking fiberglass boat with a nice broad beam for stability and molded benches lining the sides. On this morning there were only a handful of passengers, so I had plenty of room to spread out my camera gear for easy access. 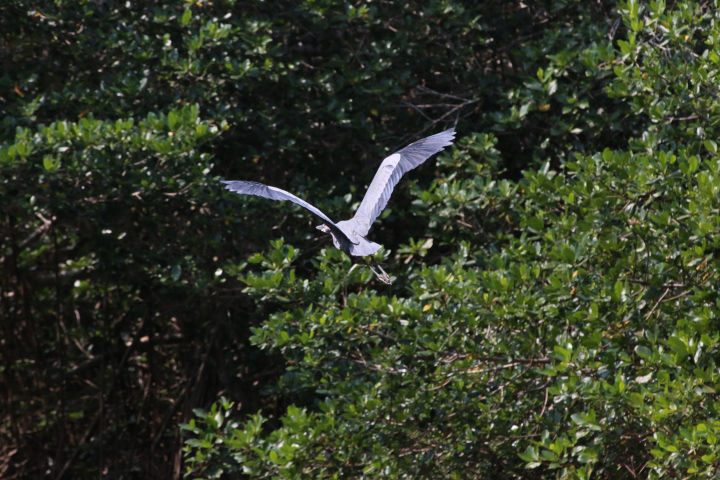 I had no idea which lenses I might need, but the moment Francisco fired up the massive outboard, a great blue heron launched itself from a nearby treetop and I immediately snapped on the telephoto plus extender. I wondered about that massive motor, because we glided across the tea-with-milk coloured river at barely idle speed. I could see some evidence of movement as water backed up slightly against the exposed roots, but the current (or ebbing tide) was minimal. Still, the tiny breeze created by our passage was a massive relief from the heat that seemed to consume the air around us every time Francisco stopped to give us a closer look at the small crabs that decorated the mangrove roots like cheery red Christmas ornaments, or to peer into the deep shade at a fat iguana resting on a branch or a clever green heron edging further into the protective growth rather than breaking cover and flying away before us as its great blue cousins invariably did. Salty sweat seeped relentlessly into my eyes every time I pressed the camera to my face and I longed for one of those cheesy 1980s-era sports headbands. But wild horses couldn’t have dragged me out of there, peering eagerly ahead into the tunnel of foliage that sometimes pressed to within arm’s reach overhead then suddenly parted to reveal an almost cloudless sky. 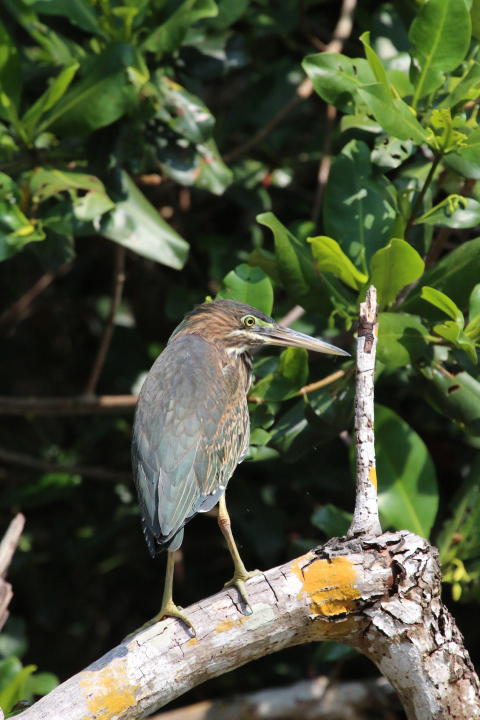 I learned to spot (or follow the pointing finger of my sharp-eyed friend to) a perching great blue and anticipate the moment it would take flight. 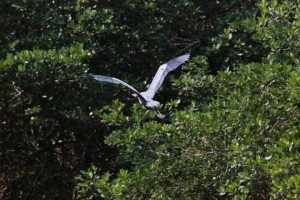 Sometimes my lens caught its great wingspan close to the water, sometimes at treetop level. I was thrilled to capture the flashy yellow breasts of robin-sized vermillion-headed flycatchers and, to my unpracticed eye, the very similar-looking great kiskadees. Without Auralia’s help, I’d just have been shooting pretty birds, but she whipped out a sheaf of laminated colour spotting guides and presto – I sound like real birdwatcher. We were all intent on spotting one particular fly-boy when Lana’s sharp eyes came through again. “There’s a snake,” she called, causing an involuntary recoil in at least one passenger. But anything for a good shot, so I followed that pointing finger and there it was, folded back and forth across itself, lazily draped along a thick branch. 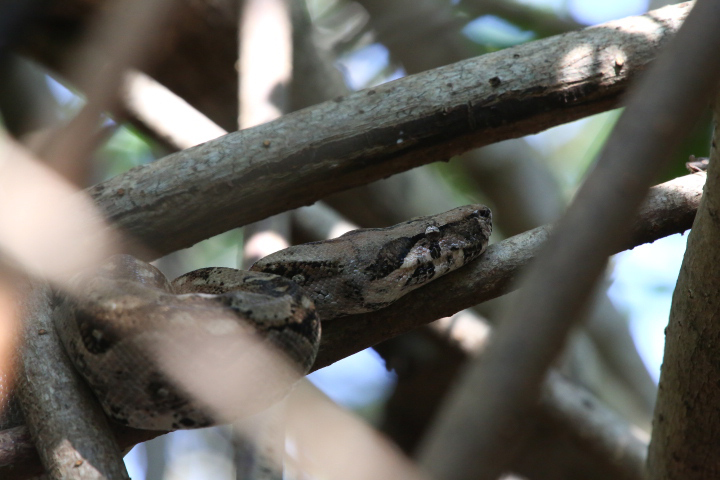 No sooner had I finished immortalizing that very handsome boa and turned my lens on a big-billed bird I could only glimpse in snatches among the leaves, when the pointer went up again. “There’s another snake,” cried Lana. This time I was really startled as I followed the line of trajectory to the branches directly overhead. “Looks like it’s just eaten,” said Auralia before I had time to completely freak. And sure enough, there was a telltale bulge in the mid-section of the otherwise sleek body. What the heck, I lifted the camera once more, although I don’t think I took a real breath until Francisco slipped the motor into gear and we glided off. Soon after I was disappointed when he pulled alongside a dock—until I realized that this wasn’t the end of the trip. Auralia led us ashore and we were allowed to escape the incredible insulating properties of our life jackets. 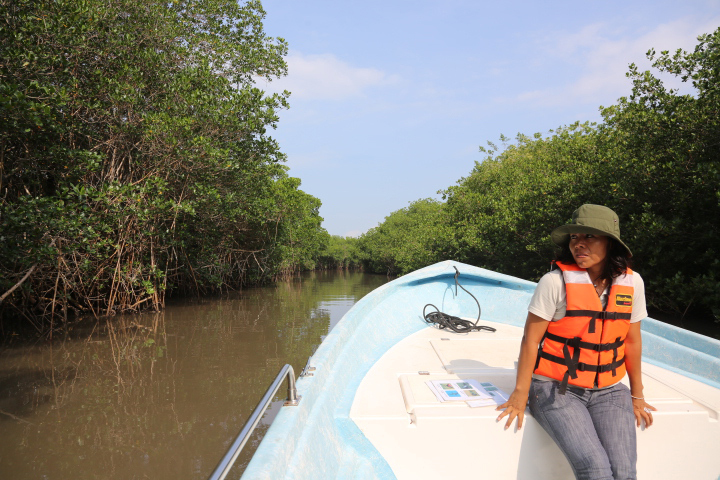 She stopped to give us a mini-lecture on mangroves, of which I now know there are 55 species worldwide, with five species in Mexico, three represented within a couple of metres of where I stood. We passed through the mangrove fringe and came into a clearing punctuated by a wooden observation tower. The view from atop the platform was a startling reality check. 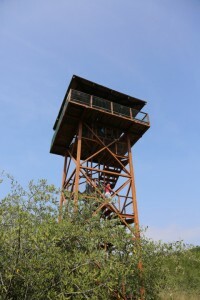 In the last hour I’d become totally immersed in the wilderness, yet standing high above the trees in the blessed breeze that dried the salty drops from my face, the tall buildings circling our little green island reminded me that this refuge lies in the midst of burgeoning urban development—making it all the more precious. Back in the boat, Francisco was on a mission. 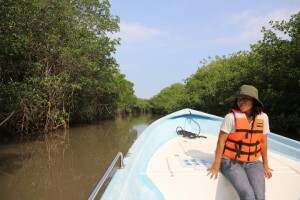 We still hadn’t spotted a crocodile, the main focus of research being carried on at El Salado. 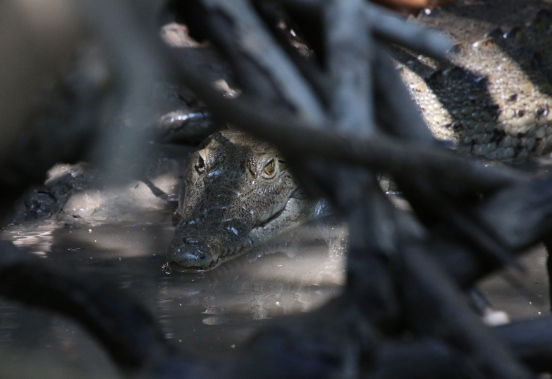 The crocs here only grow to about 1.5 metres (small compared with some monsters of their species) because they need to be compact to maneuver around the tightly packed mangrove roots. In this environment, crocs are a bellwether species: healthy croc population, healthy environment. Now every pair of eyes was focused on the small patches of dark mud visible beyond the screening roots. We needed to find a place where enough sunlight could penetrate to create the croc’s idea of the perfect beach for sunbathing. In the next few minutes, Francisco came through for us—twice. Although I dutifully raised the camera and worked for a good angle, I wasn’t sorry when the boat moved on and I could get back to looking for pretty birds. Alas, we weren’t yet finished with crocs. Back at the main dock, finally released from our smothering life jackets, we followed Auralia to a hollowed out gravel mound near the parking area. In the centre lay a few white scraps that looked to me like eggshells. Right on. Apparently, this spring a mama croc was unable to find a suitable place to lay her eggs, so the staff built up this mound for her. She duly deposited a clutch of 23 eggs and in due coarse the baby crocs broke out of their shells. Some presumably now make their home in the area, others were shipped of to the nearby satellite campus of the University of Guadalajara for research. We also met an adult hanging out in a concrete enclosure. He had foolishly wandered into the adjacent neighbourhood (gives a moment’s pause, hmmmm?) and is now in protective custody. Auralia pointed out the white tag on his tail, used to identify individuals without disturbing them in the wild. Good idea. I’m not saying I’ve particularly warmed to crocs, but I definitely appreciate the research being conducted at El Salado. And if crocs are a big part of the motivation to maintain this precious fragment of the natural environment in the face of relentless urbanization, then I’m all for ’em. But I still like the birds best. Next time you make your winter escape to Puerto Vallarta, tear yourself away from the swim-up bar for a couple of hours and see what you think.